Pre-order bonuses for Dead Space 3 include Limited Edition weapons and suits. 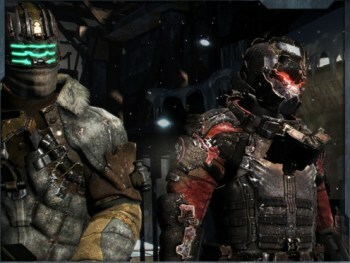 In a Gamescom press release earlier today, EA revealed some new details about Dead Space 3's release. Though we already expected the game to come out in early 2013, the publisher announced actual release dates for the next game in the series: February 5 for North America, followed by a European release three days later on February 8. The game will be available on the PC, Xbox 360, and PS3. Those who pre-order Dead Space 3 will receive the Limited Edition, which contains bonus goodies that can be used at the start of the game. The two bundles, "First Contact" and "Witness the Truth", each contain an in-game suit and weapon, which should be useful when fighting necromorphs and exploring harsh terrain. The "First Contact" bundle features an Extra-Vehicular Activity suit, which "sports a flamboyant golden finish to provide protection from long-term space exposure and thick armor for... unspecified reasons." "First Contact" also includes a gold-plated Negotiator weapon, with an "overclocked, top-mounted Tesla Beam is capable of bursting a man-sized organism into several pieces with a single shot" and a bottom-mounted Linegun. "Witness the Truth" provides gamers with the insulated Witness Suit and the Evangelizer, which has "a souped-up AL-2g assault rifle on the top with an Emerson 2100 'Big Boy' tactical shotgun on the bottom." EA's press release states that "these hand-crafted weapon combinations act as initial blueprints for the millions of permutations players will be able to create using the all-new weapon crafting system in the game." Only a few months remain until gamers can create their own crazy weapon combinations in Dead Space 3.